"Yep, it's free. Just sit down, open up your laptop and you're ready to go. 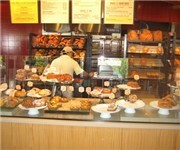 Send an email as you munch a warm bagel. Read the news as you sip a latte.